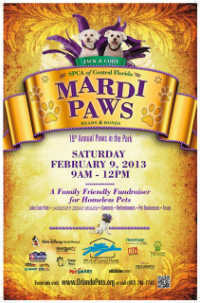 The theme for the 19th Annual Paws in the Park event is “Mardi Paws,” and it will be held on February 9, 2013, at Lake Eola in downtown Orlando. This family-friendly event helps to raise money for the SPCA of Central Florida. Bring your dogs and walk to raise funds for SPCA programs that help thousands of homeless animals find homes. This year, there will also be a new Disney Kids Zone, where kids can meet a Disney character, and participate in fun activities, such as making toys for shelter animals. 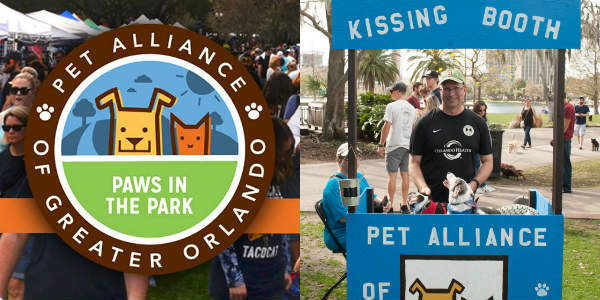 Participants can register online, at the SPCA of Central Florida on February 6 (between noon and 7pm), or day of at the event. Paws in the Park takes place from 9am to noon. For more information, visit OrlandoPets.org.